The hedgehog is a spiky mammal that lives in forests in Europe, Asia and Africa. It is similar to the porcupine found in the Americas -- you can call this craft a porcupine instead of a hedgehog if you like! In areas where the winter is cold, hedgehogs hibernate -- this means they eat lots in the autumn to store up energy and then they sleep all winter. This hedgehog uses leaves for his spikes. You can collect leaves in the summer or autumn or you can use the leaf templates I have provided if you don't want to use real leaves. If you use real leaves, be aware that after a little while they get crunchy and can make a mess if you play with them. My favorite time to make this craft is during the autumn as part of a lesson about animals that hibernate. Print out the template of choice. In this case, I think the black and white version is the best as most of the template will be covered up by leaves. Optional: Go for a nature walk and collect leaves. Do your best to find pointy shaped leaves but don't worry about the shape too much -- just find leaves you like. 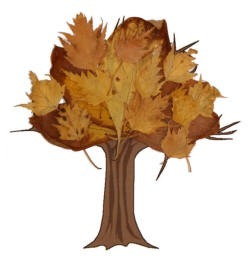 If you don't feel like using real leaves, cut some free hand from construction paper or use the leaf template I have provided (see below). Glue the leaves to the body of the hedgehog. Color in the parts of the hedgehog that aren't covered in leaves.